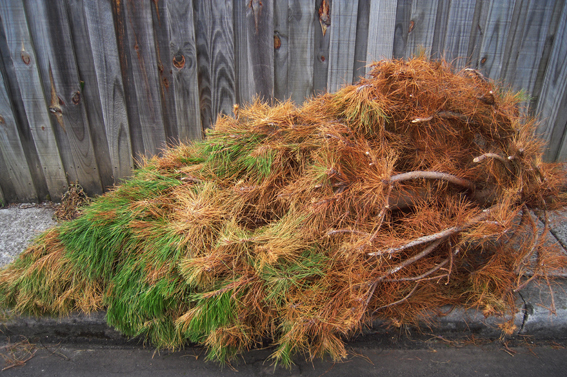 I heard a story on the news before Christmas about how a local council was offering a free pick-up service for dead Christmas trees because, according to the spokesperson, the sight of them lying in the lane-ways after Christmas was ‘depressing’. I don’t know. Burning a chocolate cake in the oven is a little depressing. Realising that people actually vote for Kevin Andrews is somewhat more depressing, and I imagine that life on the Gaza Strip or in parts of Baghdad must be pretty darn depressing from time to time. But dead Christmas trees…? I don’t feel it. Perhaps it’s that sense that dead Christmas trees are a reminder of happier days, a time of feast and celebration that is now gone for another year. Or perhaps it’s the thought of something so beautiful and alive being chopped down for the sake of a short-lived decoration. Whatever the reason, the neighbourhood must be feeling terribly down in the mouth about now. I managed to find these dead trees within a couple of streets of each other just after Christmas and without having to look too hard. There’s something poignant about them, true, and a certain beauty too despite their death, or because of it. They appear more like animals than trees now, dry and soft like bearskin, gently drowsing by the roadside but ready to be roused, if we say the right words, just like Bagpuss. Is it such a bad life being a Christmas tree? Growing tall and strong, sacrificed for a special occasion, decorated and admired in death, albeit briefly, and then left to lie in the lonely lane-way, like drunks sleeping it off. No doubt they will be put to further good use by our concerned council, chipped and mulched and made to feel wanted. Somebody more intelligent than I am will be able to calculate their contribution to global warming, but I’d like to think it’s a positive one, these mini Christmas carbon collectors. So not sad at all. Imagine if nobody bothered to grow such things in the first place and there was no good reason to do so. Now that would be depressing.